There’s a powerful intuitive link between libraries and our future. That’s probably why libraries have been a recurring feature, an anchoring reference point in science fiction that envisions the future. Frequently, in those speculative fictions libraries and librarians, along with the loss of civilization, have found themselves consigned to a forgotten dust heap. 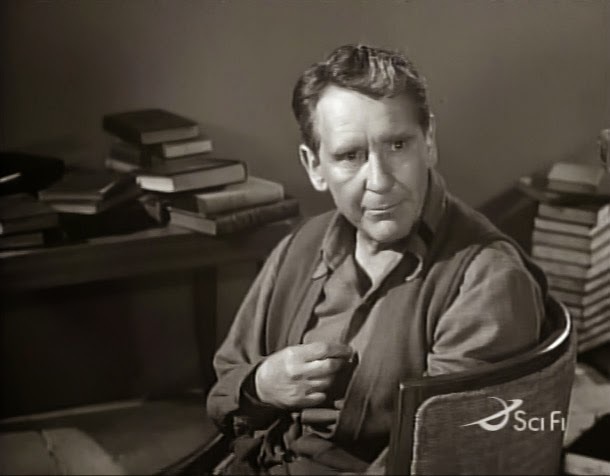 Librarian Romney Wordsworth, played by Burgess Meredith, charged with being "obsolete"
You are obsolete, Mr. Wordsworth. . . You have no function, Mr. Wordsworth. You're an anachronism, like a ghost from another time.... a crawling insect. An ugly, misformed, little creature, that has no purpose here, no meaning! . . .You're a librarian, Mr. Wordsworth. You're a dealer in books and two-cent finds and pamphlets in closed stacks in the musty insides of a language factory that spews meaningless words on an assembly line. WORDS, Mr. WORDSworth. That have no substance, no dimension, like air, like the wind. Like a vacuum, that you make believe have an existence, by scribbling index numbers on little cards. . . .Delusions, Mr. Wordsworth, DELUSIONS!! That you inject into your veins with printer's ink, the narcotics you call literature: The Bible, poetry, essays, all kinds, all of it are opiate to make you think you have a strength, when you have no strength at all!!! You are nothing, but spindly limbs and a dream, and The State has no use for your kind!!!! These words have a prophetic resonance for our time, as there are now those who, in the very name of futurism, seek as never before, to eliminate books and librarians from our New York City libraries. True, if the books are removed from the libraries, as is happening, it thereby becomes possible to argue that librarians become obsolete relics. But, conversely, if you eliminate librarians as the defenders of books, it is so much easier to banish the books. 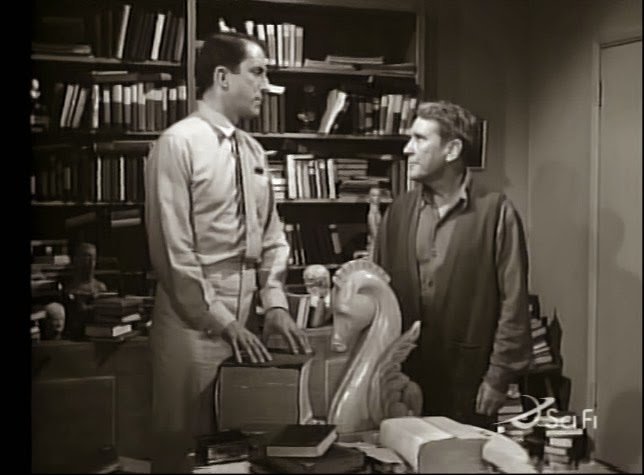 In the Twilight Zone episode, Mr. Wordsworth with his resolute declarations that he is a librarian and defense of the books proves himself to be a cagey hero conspicuously problematic to the state seeking to eliminate him along with books and the ideas they hold. You walk into this room at your own risk, because it leads to the future, not a future that will be but one that might be. This is not a new world, it is simply an extension of what began in the old one. It has patterned itself after every dictator who has ever planted the ripping imprint of a boot on the pages of history since the beginning of time. It has refinements, technological advances, and a more sophisticated approach to the destruction of human freedom. But like every one of the super-states that preceded it, it has one iron rule: logic is an enemy and truth is a menace. This is Mr. Romney Wordsworth, in his last forty-eight hours on Earth. He's a citizen of the State but will soon have to be eliminated, because he's built out of flesh and because he has a mind. 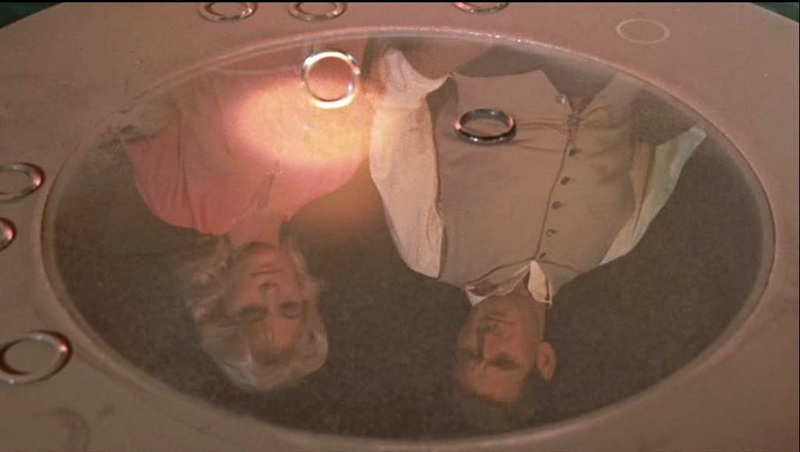 Mr. Romney Wordsworth, who will draw his last breaths in The Twilight Zone. Indeed, the script’s dialogue makes specific reference to the facts how this state of the future is endeavoring to follow in the footsteps of Hitler and Stalin who, according to the Chancellor, “had the beginnings of the right idea” but did not go far enough. Libraries are the mainstays of democracy. The first thing dictators do when taking over a country is close all the libraries, because libraries are full of ideas. The elimination of books is closely associated with dictatorships and totalitarianism. Hitler’s Nazi book burnings and those of Chilean dictator Augusto Pinochet are just two recent examples. Interestingly, these two dictators may have presided over the elimination of books that others might have read but each, both Hitler and Pinochet, kept their own valued private libraries. 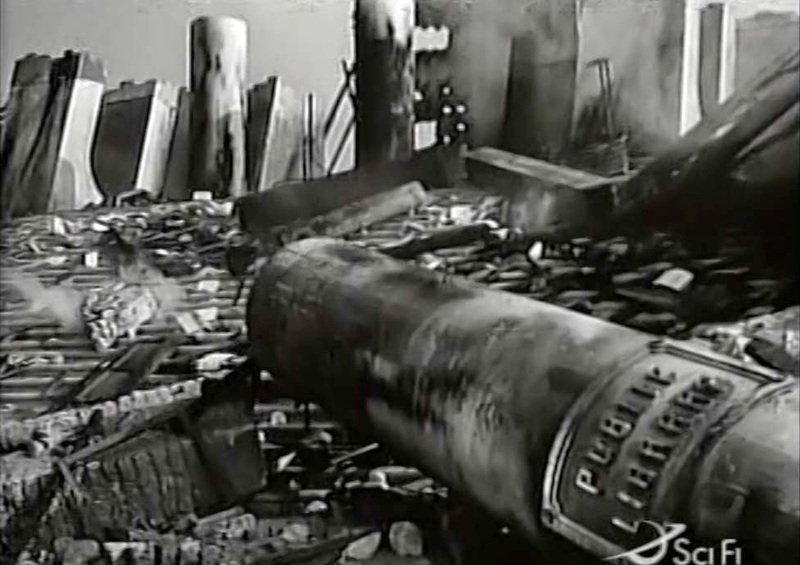 Books being burned in "The Day After Tomorrow"
Hitler’s book burnings were reportedly the spur to the writing of “Fahrenheit 451" by Ray Bradbury, coincidentally, like Rod Serling, host and author the Twilight Zone episode, another science fiction writer reported to be Unitarian. 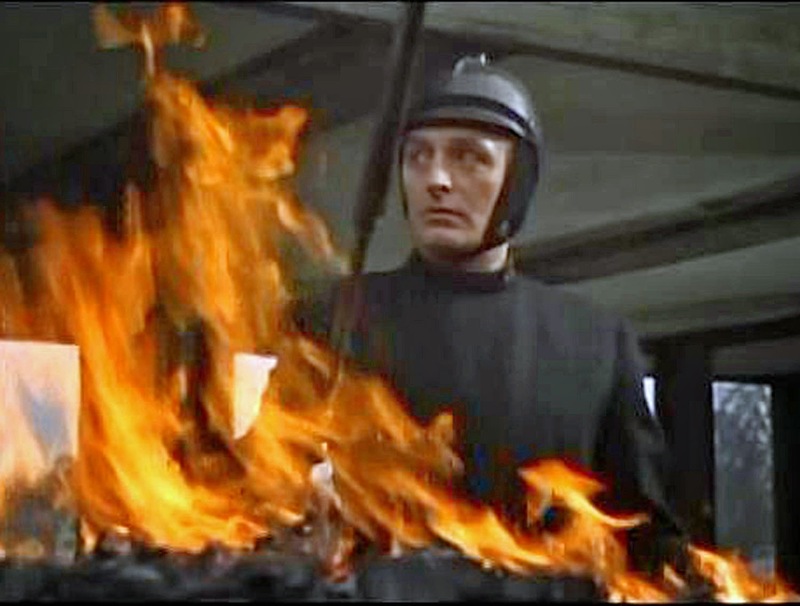 In Bradbury's “Fahrenheit 451" book burning is carried out on an institutionalized basis by the government's "Fire Department." Religions, although not Unitarians, have engaged in their fair share of book burnings over the ages, including, in essence the equivalent of Bible burning, when the many alternative gospels that were not incorporated in the official codification of the New Testament (Circa 367 AD after the AD 325 Council of Nicea) and other works like the "heretical" teachings of Arius were banned and and intentionally destroyed. the sentiment that drove the sales probably had less to do with those messages and more to do with the impulse to preserve a world in which the speech of the many cannot be held hostage by a few. 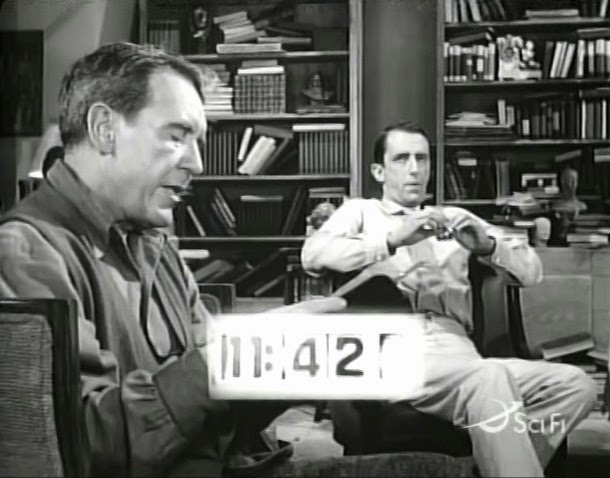 In the Twilight Zone episode and “Fahrenheit 451" the protagonist’s lives are on the line because of their book-defending stance against the state. It’s not only a fiction that people sacrifice and put their lives at stake in opposition to libricide or biblioclasm as book burning is sometimes otherwise termed. In 1992 during the Bosian war, when the ethnic-cleansing, anti-Muslim Serbs targeted the Bosnian National and University Library in Sarajevo with incendiary shells, citizens worked to rescue books under a hail of sniper fire. 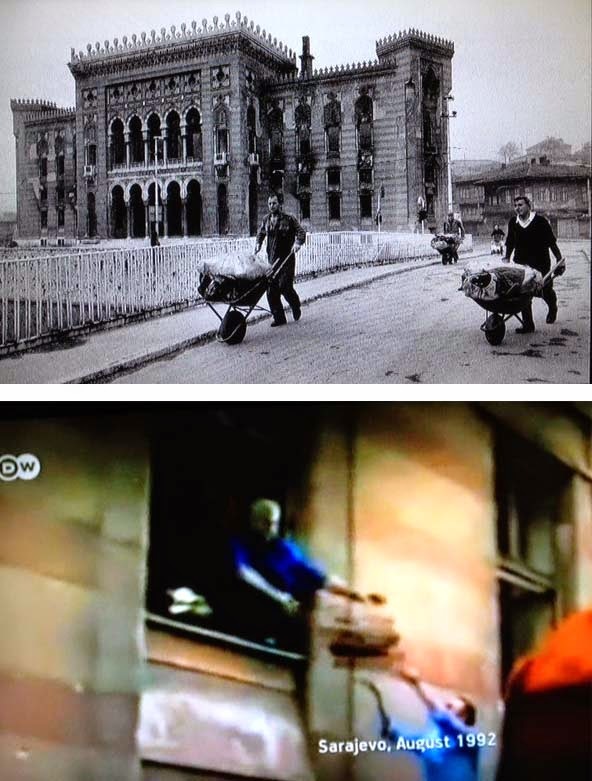 Two scenes of Sarajevo citizens working to rescue books from the libraries, the second from a video. Lives were lost. Both images appeared in the documentary “The 50 Year Argument” about the New York Review of Books. 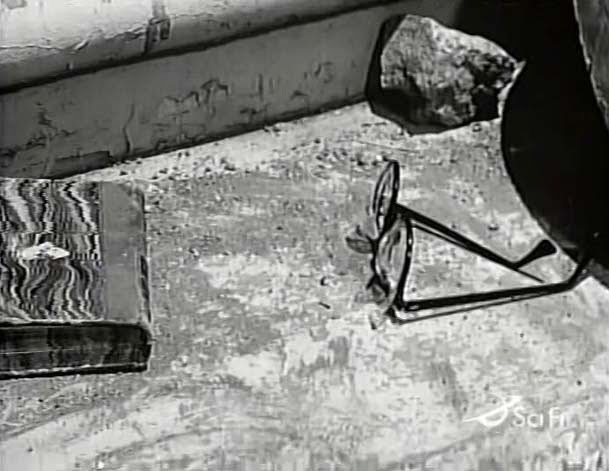 Those who have seen the 1959 “Time Enough at Last” episode will remember the famous scene where the Henry Bemis character sits on the steps of a destroyed 42nd Street Library with a stack of books to read using his ultra-thick glasses before . . . a cruel fate befalls. 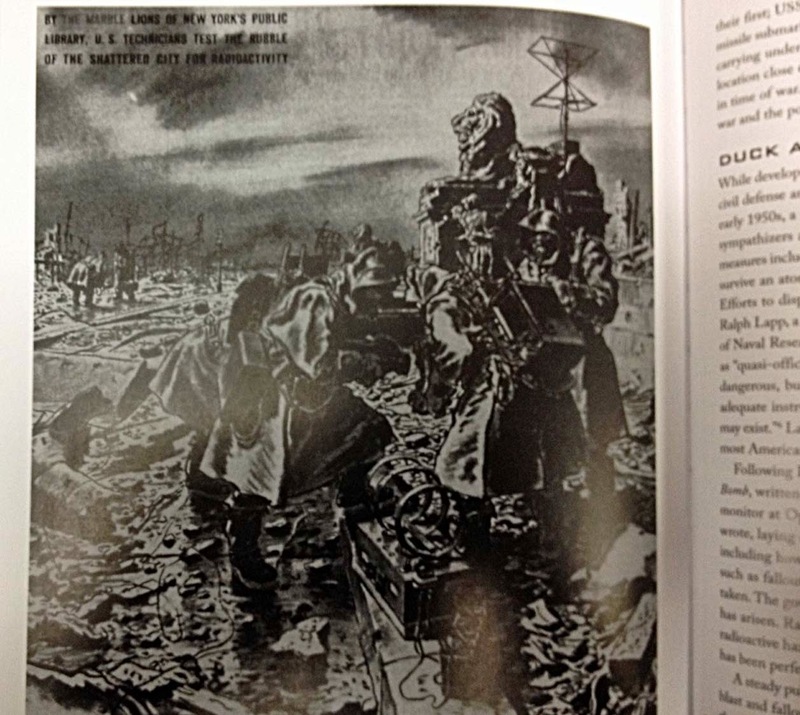 Early in the Cold War with its “duck and cover” accouterments and a few years before the October 1962 Cuban Missile Crisis, the scene of this Twilight Zone fable echoed images of the time of what nuclear war’s possible aftermath would look like, as in this drawing of a Geiger Counter being used to get radioactivity level reading outside the 42nd Street Central Reference Library in “Nuclear Dawn” (a book not available in the Brooklyn Public Library system). 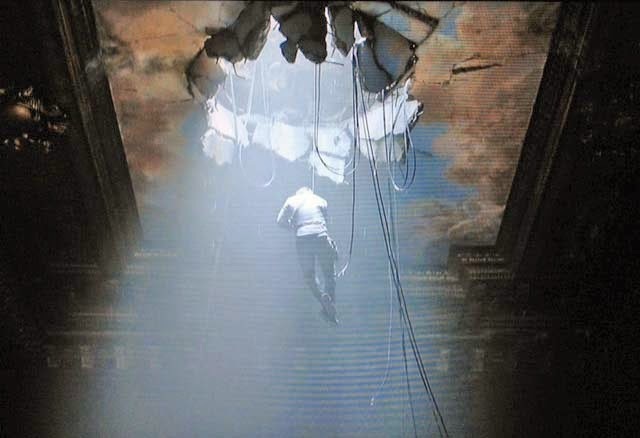 In the story Bemis survives having been inside a bank vault when the bomb fell. Reportedly, the steps of the post nuclear war library upon which Meredith's Henry Bemis character sits in despair in “Time Enough at Last” are the same post nuclear war library steps that were used for George Pal’s 1960 version of H. G. Wells’ “The Time Machine” filming around the same time as the Twilight Zone at Metro-Goldwyn-Mayer Studio Culver City locations. 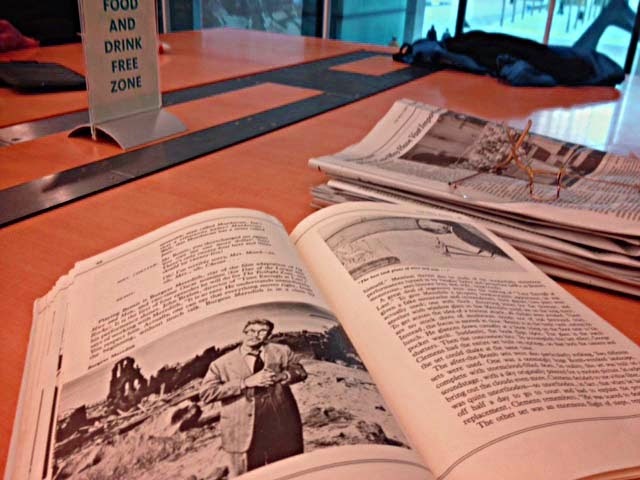 I took a drenching rain day trip to Brooklyn’s Grand Army Plaza Library to verify and read more about this in the BPL’s only copy of “The Twilight Zone Companion,” but my visit wasn’t fruitful. That sole volume is now reported as lost. Filmed about the same time, the MGM steps in Culver City city stand in for two alternative post apocalypse libraries providing seating for Yvette Mimieux and Rod Taylor in "The Time Machine" and Burgess Meridith in The Twilight Zone. H. G. Wells, author of the “The Time Machine,” is one of the authors that Nazi book-burners sought to eradicate. 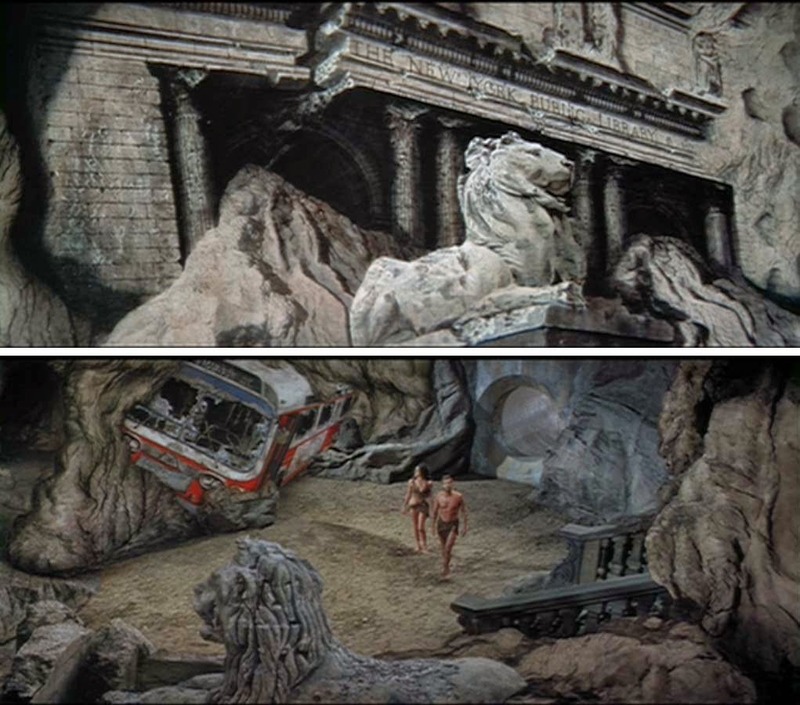 In the 1960 George Pal “The Time Machine” it is not the nuclear war in the plot that has destroyed the library. It is the apathetic lassitude and lack of curiosity of the Eloi who have inherited this patrimony and let it decay unused. 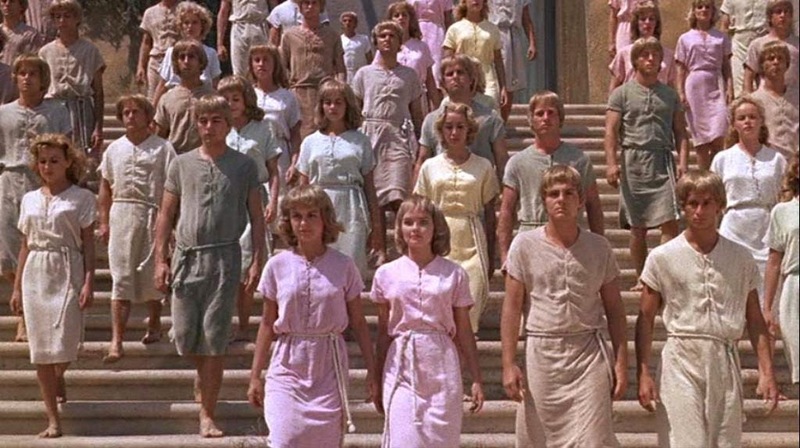 The Eloi who lack concern about their own fate and well-being are one of two branches into which the human race has evolved in year 802,701, the other race being the Morlocks who cannibalistically prey upon the Eloi. “Yes...they do tell me all about you!” says the time traveler as the book crumbles in his hands. In the plot the Morlocks are the descendants of those humans who retreated underground in the aftermath of the war, the Eloi the descendants of those who remained above ground. 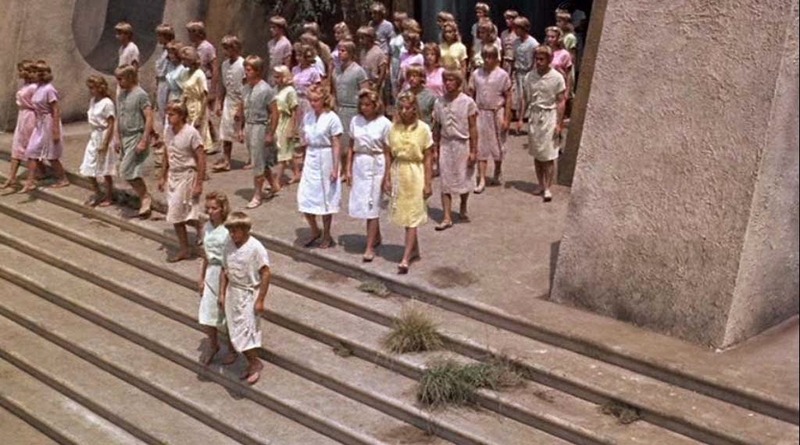 If the Morlock/Eloi split could be viewed as a cautionary metaphor for what is happening in our current day “Tale of two Cities” culture might it be the split between the 99% and the winner-take-all 1% that economically preys on the rest of the populace? The Eloi might be that evolving sect preoccupied with, addicted to, the distraction of our smartphones. 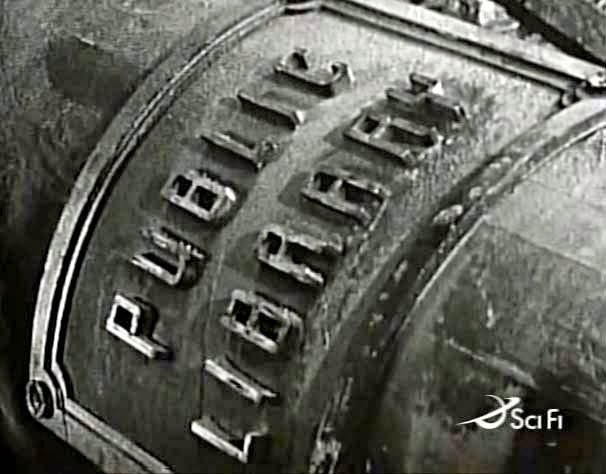 The 1960 version of “The Time Machine” ends with the time traveler returning to the future with plans to reestablish civilization amongst the Eloi. His plans cryptically involve taking with him into the future three books that are noticed by his housekeeper to have vanished with his departure from his personal library. The audience is invited to guess what three books those would have been. 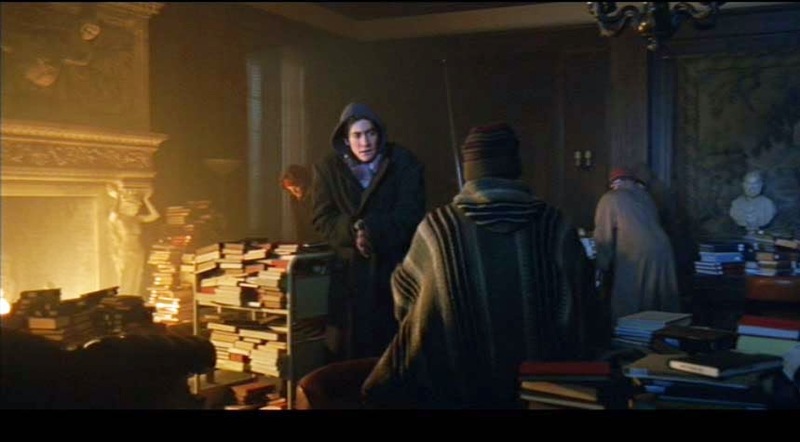 In the 2002 remake of "The Time Machine" the time traveler shows up in an explicitly rendered version of the 42nd Street Central Reference library in the year 2030. There is a now hard-to-obtain, 2002 remake of “The Time Machine” that shifts the action from London to New York and features, very explicitly, the NYPL 42nd Street Reference Library of the future. In an imagining of what the library would be in in 2030 that coincides markedly with the dreams of the real estate-oriented crew that, in 2004, soon after the movie was made, took over the NYPL’s libraries with plans to sell and shrink them, the library is virtually bookless and manned by a robotic artificial intelligence hologram. Superintendence by robot librarians is a path down which the libraries may now well be heading, see: Tuesday, November 25, 2014, BPL's Bklyn BookMatch- A Match For The Human Race's Book Future? : Electronic Books and Robot Librarians? The robotic artificial intelligence librarian manning the library, played by Olando Bloom, puts time travel in the category of science fiction. 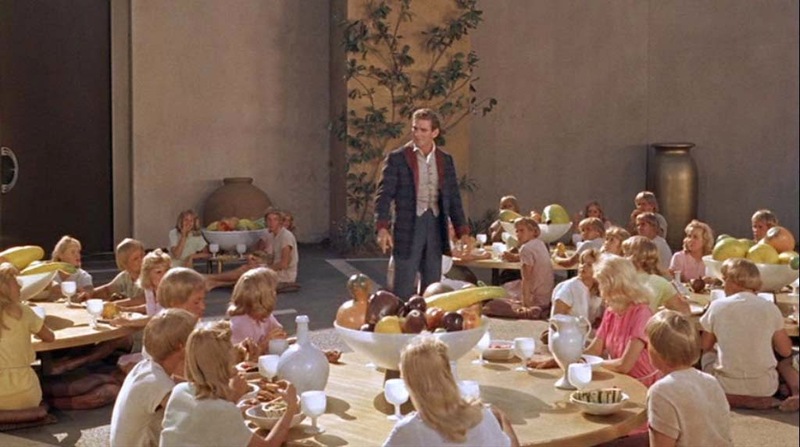 The remake tracks the original plot roughly so that again it finds a split of the human race in the year 802,701 between Eloi and Morlocks. In the 2002 version the destruction of the modern human race has come about in a more benign, less bellicose fashion, the result of a technological accident involving the destruction of the moon by space colonists. In 2037 the moon begins to break up in the 2002 version of "The Time Machine"
The image of the broken-up moon of year 2077 that you see in the opening sequence of 2013's "Oblivion"
“Oblivion,” the 2013 science fiction film with Tom Cruise, also feature a future visit to very recognizable 42nd Street Central Reference Library. In that film, too, modern human civilization has been wiped out by the destruction of the earth’s moon, this time intentionally for that purpose by aliens from the planet Jupiter. In this film, too, there is an issue of remembering the past with the Tom Cruise character and his partner, a lonely duo, looking after affairs on earth having been subject to a “mandatory memory wipe.” Books again invoke a beneficial connection with the past, factoring in the plot. 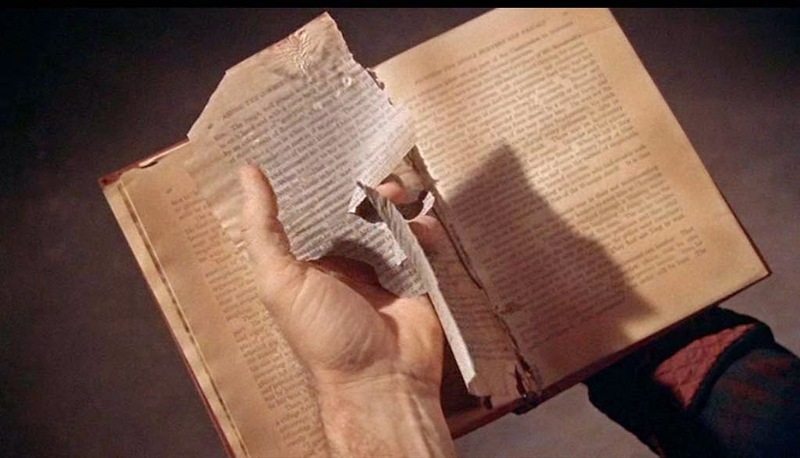 The Cruise character, Jack, retrieves, keeps and reads, from the library ruins, “Lays of Ancient Rome.” “Tale of two Cities,” by Dickens is another of the books he secretly saves in a lakeside wilderness retreat. “Pickwick Papers” and “David Copperfield,” two more books by Dickens are two of the books that “book people” in the woods by the river memorize and personally “become” at the end of the Ray Bradbury’s “Fahrenheit 451.” “David Copperfield” is also a favorite of Henry Bemis in the “Time Enough at Last” episode of the "Twilight Zone"
It’s all the more startling to see Tom Cruise hurtling down, suspended on a rope, through a gaping hole in the ornate ceiling of the Rose Reading Room and the ensuing destruction occurring there in this 2013 film now that, in 2014, the Rose Reading Room, a significant public space, was closed (and still is) when a chunk of the ceiling reportedly fell down, for real, in the middle of the night. A startling development, the incident occurred May 30th, two weeks after the NYPL was forced to abandon its plans for the consolidating shrinkage of the Central Library Plan that, among other things, involved banishing millions of books from its premises. It occurred four days before the NYPL would announce that the Central Library plan would cost hundreds of millions of dollars more than it had previously publicized. 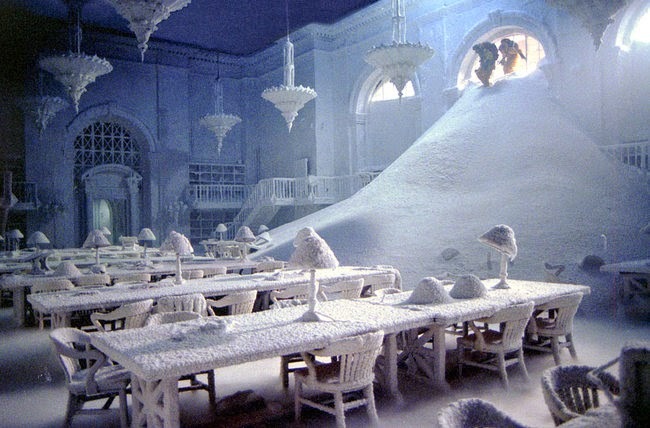 The Rose Reading Room also appears equally recognizably and transformed in another end of the world disaster film, the 2004 “The Day After Tomorrow.” In an immensely silly plot the earth’s climate goes haywire racing into catastrophic chaos, in a matter of days battering Manhattan and the library with a tidal wave, then dropping it into a deep freeze where some of the protagonists debate which books to burn first as they warm themselves with the fire. The voluminous Tax Code volumes are cheerily consigned to the flames; the fate that Nietzsche deserves is debated. One Gutenberg Bible is rescued from the rare books room by a resolute librarian protector, not because he believes in God, but because it is “the first book ever printed” (in the 1450s) representing “the dawn of the age of reason” (the early 1700s) and “as far as I'm concerned, the written word is mankind's greatest achievement” and “if Western civilization is finished . . .I'm gonna save at least one little piece of it.” In the Twilight Zone’s “Obsolete Man” episode it is a copy of the Bible that Romney Wordsworth keeps locked in a safe, his value of it inversely related to the totalitarian state’s ban of it, but Wordsworth believes in God. 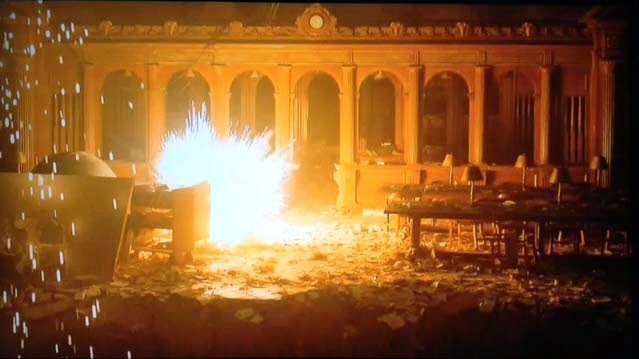 Books from the Rose Reading Room being trundled into the flames. 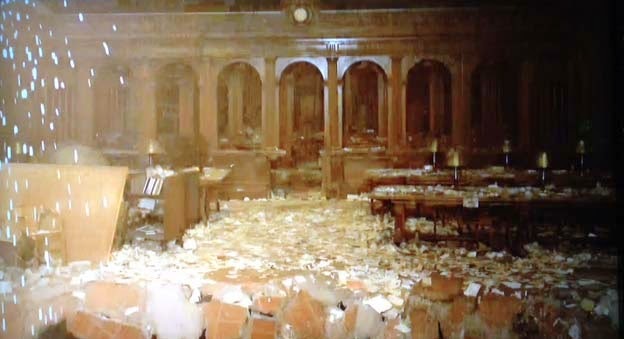 If “The Day After Tomorrow” survivors were to arrive at the Rose Reading Room this week they would probably be chagrined to discover how few books they’d find there for fuel because the Rose Reading Room is currently empty and millions more of the library’s books have been sent off-site. Sacrificing Western civilization in order to sustain the life of imperiled survivors is not exactly Nazi book burning. 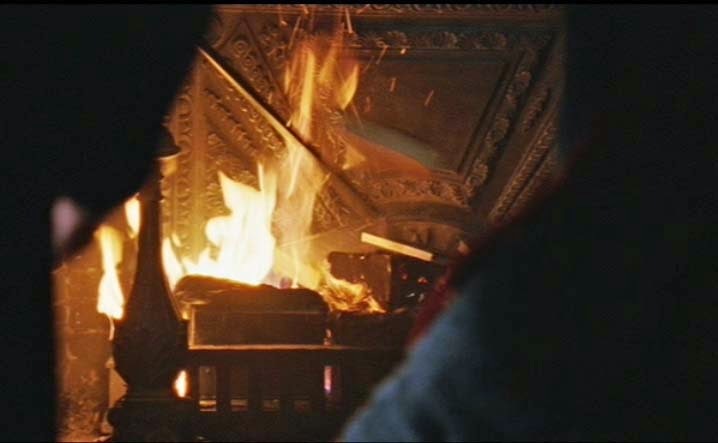 On the other hand, it lacks the lighthearted optimism of Puccini’s “La Bohème" when Rudolpho similarly burns his own manuscript to stave off the cold he and Marcello suffer in their garret studio on Christmas Eve, the implication being that the thus warmed Rudolpho embodies his own work (a converse to “Fahrenheit’s” book people who have absorbed the work of others). Rudolpho will live to write better plays in the future, perhaps even involving the experience of that very evening. One reason we closely associate libraries with the future is that we think of them as helping us steer our course into it. That’s something we are not doing well when it comes to climate change. Although this film makes climate change the threat and climate science denial the villain, its choice to go with utterly fantastic spectacles does no favor for those endeavoring to bring recognition of real climate science to the fore. A far better and more terrifyingly speculative film about the implications of climate change could easily have been made based on real climate science and made for far less than the $125 million that was spent making this disaster that panders with such formulaic expectations about box-office economics. Could the destruction and underfunding of libraries help contribute to our misunderstanding of climate science, tilting us toward more likely calamity? The answer is YES, very definitely, see: Tuesday, February 11, 2014, Libraries And Climate Change: The Dangerous Destruction of Information We May Need To Know To Survive. One thing these science fiction scripts get right, is that there is a high correspondence, if not quite one-to-one, between the demise of great libraries and the collapse of great civilizations. See: Books on Fire: The Destruction of Libraries throughout History, by Lucien X. Polastron (2007). Oh, to know what the thousands of destroyed Mayan codices would have revealed! Destruction of libraries and books by tyrants, destruction by war, destruction by apathetic indifference, destruction by aliens hostile to the human race and destruction by losing our way in the face of climate change, may seem to cover the gamut, but it still doesn’t cover all the possibilities. The New York Times recently ran an editorial castigating “some large hotel chains” who “want to block guests from using their own wireless Internet devices. .. a blatant attempt to limit customer choice.” See: Brazen Attempts by Hotels to Block Wi-Fi, by The Editorial Board January 3, 2015. Which is to say don’t under estimate private enterprise’s propensity to try to restrict and limit the free flow of what could be readily available communication and information in hopes that, through limitation, private companies can instead charge for it. the Marriott International and the American Hotel and Lodging Association are asking the F.C.C. to give hotels the green light to remotely disable the Wi-Fi devices that some travelers use to connect their laptops and tablet computers to the Internet through cellular services from companies like Verizon. This would force guests to buy the wireless Internet service provided by hotels. The editorial notes that the F.C.C. has already fined Marriott for engaging in the practice. It is a lot like the way that Hershey's as a profit enhancement maneuver is now curtailing the competitive sale of better-made, better-tasting chocolates Cadbury imports (link to article by same Times reporter reporting about sale of Brooklyn Heights Library). It is interesting to note that the initiative to sell and shrink libraries in New York City originated under the Michael Bloomberg mayoral administration and that Michael Bloomberg owns a company that sells information and content. Bloomberg donated three of his signature Bloomberg financial information terminals to the NYPL’s Science, Industry and Business Library (SIBL) at 34th Street and Madison, something that may have been good advertising for his “generosity,” but the terminals, although they can, for instance, be used in short restricted sessions to find jobs in the financial sector offer to the non-fee paying library-using public the Bloomberg terminal services and information, with a twenty-minute time delay, a lower-priced edition from what is offered to those on Wall Street who will pay full price. Writing this article, in large part about a lot of films, I was struck by how difficult it has become to get much of the content I needed as reference material. My attention was drawn to the recent wholesale disappearance of video stores. Not many years ago I had many engaging conversations with a cinephile colleague at work. At home he and his would routinely organize and curate their own film festivals centered around the oeuvre of a chosen director or actor or maybe a genre. The films were initially all rented on video tape but when DVD technology with its improved picture quality came in that shifted over. In a similar vein, my favorite local video store downstairs in the building where I lived used to have a “dead actors special” whenever a well-known actor died, pulling out from their stacks all the films in which that actor appeared and setting them up on the counter for more prominent display. Films could easily be watched in a broader context, not just in the urged response to recent publicity campaigns. Between 2010 and 2012, the number of video/disc rental stores in New York state went from 451 to 198 according to the U.S. Census Bureau. In 2002 there were 885, 731 in 2007. Unlike video stores, patronage of New York City libraries is way up. 885 New York City stores down to what could now be fewer than one hundred? That’s a vast industry, many workers and owners that have disappeared. The stores have been supplanted by Netflix and streaming. To a certain extent libraries also competed with them and perform functions in the void they are leaving. Originally Netflix just provided DVDs by mail, supplying conveniently much the same variety of content as video stores, but without the same immediacy or curating personal interface. Now Netflix streams films, but as customers shift over its streaming content is rather limited as other suppliers with which it competes seeking to lock up the rights. Experimenting, I rented for streaming the 1960 version of “The Time Machine” It’s only available from Amazon. The 2002 remake is not available for streaming. The experience was not very satisfactory. The film’s resolution was poor, probably equivalent to early VHS quality. Once started, I was required to watch it within 24 hours before it disappeared. I paid about as much as I might have at a video store. Amazon has other films available for high-definition rental, more than Netflix it looks like, but the prices are alarmingly high, even if sometimes less than the cost of mass transit to and from a central library. * It occurred to me that Amazon, without the overhead of physical video rental stores and a lock on the license to rent, pockets a fair amount of money on these rentals, money that used to flow more broadly through the economy. In 1996 the New York Times proclaimed that SIBL was the "Library of the Future." Now the NYPL would like to argue that it's obsolete so it can sell its real estate. 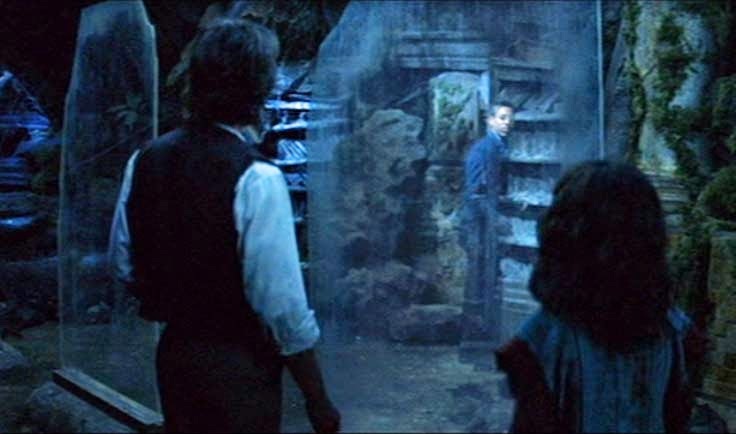 In the 2002 remake of “The Time machine,” the traveler finds, improbably, that in year 802,701 the holographic librarian, Vox 144, encountered in his 2030 time stop, is still up and running. Vox 144 must have been a very robust system and still around when the moon and civilization was destroyed in 2037, seven years later. Seven years? : That’s a lot of Moor’s Law bi-annual doubling of computing power for Mr. Vox, the A.I. librarian, to have remained around and still be working and all the proper connectors still available. 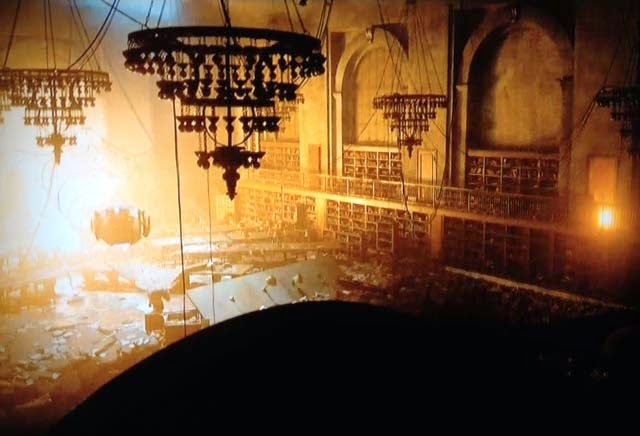 “144" indicates that this “librarian” had previously already gone through a number of iterations in the 28 years the film posits transpired between the making of the film and the time traveler’s 2030 visit. In 802,701 ruins Mr.. Vox 144 is found to be still operational and on the job. What is more unlikely: That for seven years Vox edition 144 would have continued in operation, not supplanted by by multiple upgrades, or that he could `take a licking and keep on ticking' for the 800,664 years that afterwards ensued? Seven years? In roughly that period of time we went from all the techno-geeks brandishing Palm Pilots and Blackberries to them having Apple iPhones. Technology’s rapid rate of change has led to a new uneasy impermanence. Science fiction tries to predict the future, but the future is not always so easy to predict. SIBL, the NYPL’s Science, Industry and Business Library, was opened in1996 heralded as a cutting edge technological marvel and yet starting in 2005 or 2006 the NYPL began to conceive plans to sell it and was soon heaping scorn on its design for inadequately predicting the shape the future would take. The “library of the future” and the “library of the 21st century” said the New York Times when it opened emphasizing, “even the smell of the place, like the newest of new cars, emanates `future.‘” Truth to tell, the library is adaptable and doesn’t deserve the scorn heaped on it for the convenience of justifying the real estate deals that were really motivating the NYPL. The 1960 "The Time Machine" envisions a much simpler technology than Mr. Vox surviving to tell of the past: Gold rings that talk when spun. Now library administration officials, with real estate redevelopment deals lurking in the background, are talking about how New York City libraries around the city are in need of redevelopment because they don’t have enough electrical outlets (actually a very easy upgrade) and, implicitly not enough computers. Meanwhile, SIBL the one library with a resplendent superfluity of electrical outlets, computer terminals, ethernet connections and fast wi-fi connections, everything necessary to erase the so-called digital divide for less advantaged New Yorkers, is still being prioritized for sale. Views of two small portions of SIBL (click to enlarge), an unadvertised midtown treasure, with resources galore available to "close the digital divide." In addition to the chairs set up on the left, SIBL has auditorium spaces and multiple meeting rooms, training centers and conference center. 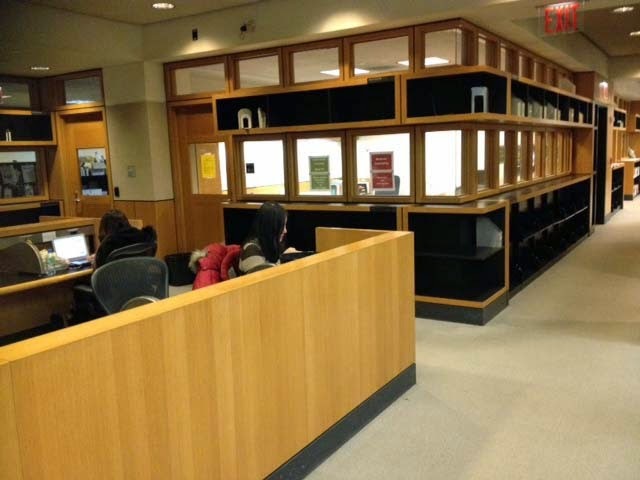 Two examples of how the NYPL with plans to sell off and shrink libraries has been emptying the shelves at SIBL. The library once held over a million books; now books there number about 50,000 according to the NYPL. Above and below floor plans of the SIBL's currently existing areas (click to enlarge). 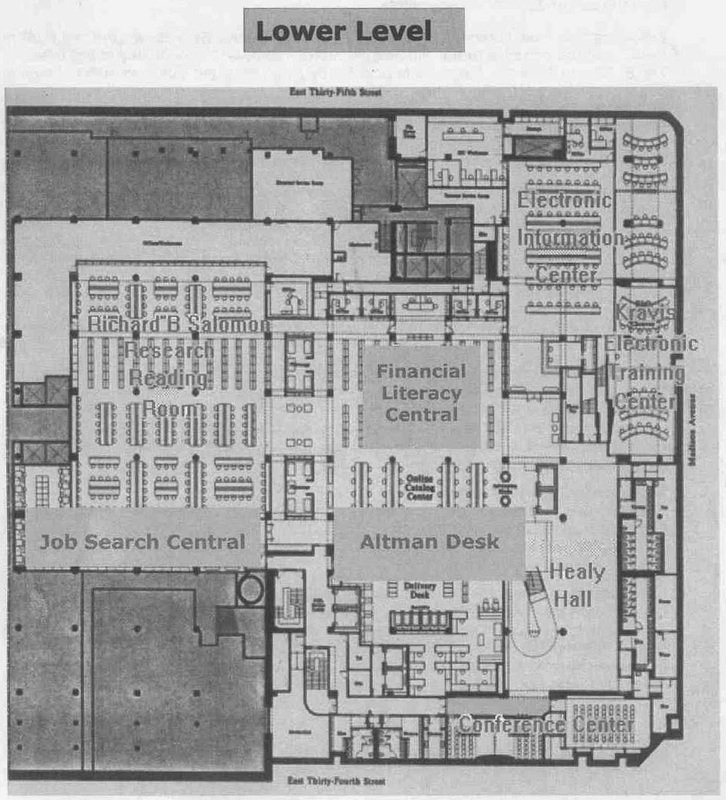 The floor plans do not show substantial areas, now sold off, where millions of books and reference materials were stored. In the same building as SIBL the CUNY (City University Library of New York) library's shelves are packed with books. Once upon a time, prior to current real estate ambitions, adjacent SIBL's supply of books was supposed to act synergistically as a robust supplement to CUNY's library. Part of the original 1960 “Time Machine’s” charm was use of the rapid advance of time for social commentary on the vicissitudes of fashion. The time traveler is positioned so as to be able to see a stationary mannequin in the shop window across the way from his house and its costumes constantly change. “That’s a dress?” says the time traveler disbelievingly at one point as he slows his rate of movement through time to take it in. In homage to the original 1960 "Time Machine's" commentary on the vicissitudes of fashion (left) the 2002 remake replicates with its own set of mannequins (right) the ever-changing notions of what is modern and in "style"
Time travel stories also traffic in a sort of Rip Van Winkle charm to the extent that the traveler, like Rip Van Winkle, comes out of the past to wonder at a world, our own present, which we already know and understand the history of. That technology has its dark, paranoia-inspiring side is a given. This is the focus of a new British anthology TV series (available through Netflix), “Black Mirror.” On The Media covered the series, in an interview with its creator, Charlie Brooker: the “unsettling plausibility to most of these plots” with technology serving “as the backdrop for each episode, all very dark, but in manifestly different ways.” Repeated comparisons were made to discuss the series as “the Twilight Zone updated for the digital age.” It’s a series of `what ifs' about now contemporary concerns. And you've even cited one of their dark O'Henry type episodes where a luckless bookworm wanders through the rubble following a nuclear holocaust. He thinks he's the last man on earth. Decides to kill himself. And then he sees a library nearby just as he lifts the gun to his temple. He suddenly realizes he can now read all the books he wants, uninterrupted. But when he reaches for the first book, his glasses fall off and smash on the floor, and he ends the episode weeping and alone. Gladstone says that it reminds her of a specific episode of The Black Mirror, “The Entire History of You,” which is about a technological world of TMI (Too Much Information). Maybe that’s The Black Mirror episode most like that Twilight Zone episode, but the episode could be rewritten into a more explicitly analogous sort of Rip Van Winkle plot. 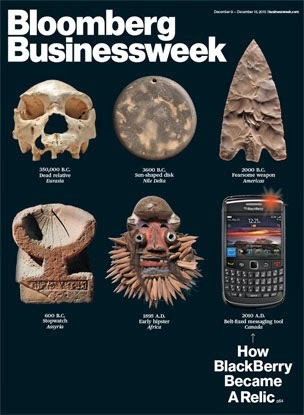 Haven’t we all had our technology go obsolete frighteningly fast? I may often find myself arguing for perseverance of the tried and true multi-hundred year old technology of traditional libraries, but I hardly consider myself a technological Luddite. And sometimes that’s frustrating. Let me give you my own litany. Did you all transfer all your data sets from your Palm Pilots to your iPhones (it was mostly possible), or did you start entering data anew, reinventing the wheel? . . . . I remember when I bought the media player program for the music stored on my computer and I went with the higher price version of buying the program for life with all future updates. It turned out that “for life” meant for the life of the program which was bought by another company that ultimately decided to terminate it. Say goodbye to whatever play lists you might have constructed! . . . The software technology was tied in with RCA hardware that electronically broadcast the music through my home. Goodbye, Tata! . . . I bought a wonderful little iPad and computer app that meant I could travel and stream all my music from my home computer, listening to it as I traveled on my iPad, phone or any computer I had with me. Not nice to discover on a long trip that the company that provided it has been bought by a company that immediately discontinued the service. . . .What if you wanted to just carry around all your music? Storage has become a cheap commodity so that should be easy. Apple used to have iPods with capacity to store 160 gigabytes of songs, enough to encompass the entirety of most people’s collections- But now Apple only sells dedicated players that will hold up to 64 gigs- They want you to store your music on their cloud so they can keep track of what you listen to. . . .You could buy Apple's most expensive mini-iPad and use if for a 128 gig music player, but then you wouldn’t have space on it for any of the other uses that instilled its top-of-the line price. . .Isn’t HD radio the greatest thing? With CD quality clarity and the listing channels it broadcast it’s another substitute for carrying around your own music. Everybody, all the best stations are now broadcasting in it. But hope you bought your receiver a while ago, because nobody is selling them now. . . . Now I go to certain websites with my Internet Explorer browser and they tell me that my browser is out of date and the sites cannot be viewed, but when I go to Microsoft to update my browser I get message that my browser cannot be updated because the XP operating system is no longer supported and I am directed to buy a new computer as the solution! . . . Is the iPad a handy substitute for browsing the internet? Not when its browser crashes and can’t be fixed because it is too old. Time to buy a new one. . . . Another reason to do that? I want to put a word processing program on the iPad, something that used to be possible, but now it can’t be done without updating the operating system- And Apple has made a choice, apparently a marketing one, not to release updates for its older models- Time to buy a new iPad. . . . When you buy that new iPad/iPhone be ready to by the new connectors and battery chargers you will need. . . Did you like that new compact high-definition Flip video camera that was destined to take over the market? Have you finally mastered its software? Well the company that bought the Flip camera because it was going to take over the market quickly stopped manufacturing it because there was, they figured, no future in it. That means you won’t be able to replace the battery, so you can throw it away. . . . And what about mastering software? I was once ahead of everyone with my mastery of Excel, but when I bought that new computer I had to buy the new version so it suddenly takes me forever to figure again out how to do anything I used to be able to do easily. . . The moral is that you spend a lot of time getting technological things in place and making them work and then, voilà, they’re gone. You are expected to keep pace or technology’s magic will vanish and leave you behind. Maybe we are mildly bemused when someone surfaces from an extended spate in prison and is flabbergasted when he suddenly has to struggle to understand a world of cell phones, where computers control the innards of our cars, people Skype on flat surfaced tablets and the internet permeates everything around you, but what if we were the ones that fell behind? Techie Rip Van Winkle, has a bit of a bout with the grog. Did his Siri/"Her" mode wake-up service fail to call him because it had been bought and dismantled by another company in the night? At today’s accelerating pace it wouldn’t have to be too much of a bender that needed to be slept off, quite short of a full-fledged month’s long coma. . . He wakes to find he’s totally behind in keeping his technology up-to-date, he’s missed his windows of opportunity to upgrade and now nothing is working for him. He can’t upgrade to start keeping pace again because he has no way to connect back into the system. Even his money to subsist is no good because he can no longer interface with his bank for his financial credits, etc. 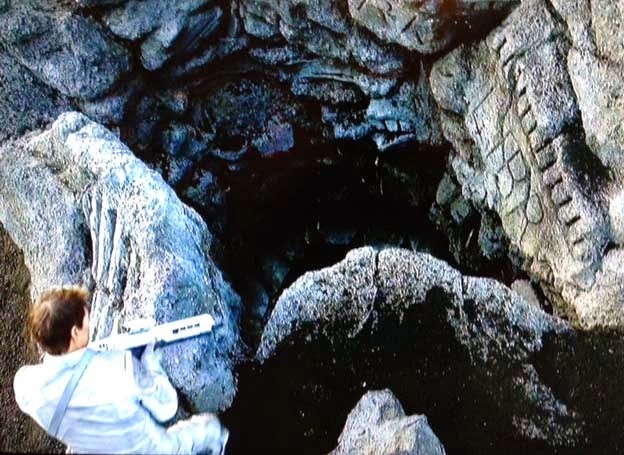 Maybe, before this disaster, the same techie in the opening scenes had been so busy installing, fervently pursuing perfection, all his cutting edge hardware and software that he he’s actually had no time to enjoy his content, sit back and enjoy his music, watch his movies or read his books? made a passionate defense of the survival of the book when he asked his audience to imagine a device that "can go anywhere, is totally portable. . . . Something that can be started and stopped at will [and] requires no electric energy to operate." This dream device is, of course, the book. "It will never be surpassed because it represents the minimum technology with the maximum interaction you can have." The above excerpt is from a comprehensive article, Libraries in Science Fiction, by James Gunn, covering the literature of the genre. Maybe the end of this posited “Black Mirror” episode is the techie’s relief as he discovers a pile of still readable books discarded by the back steps of a library. . . I suppose that if the episode turns “shockingly cruel” before fade out, that’s when the license of the techie’s Google Contact Lenses fails. . .
On the Media’s analysis is that “Black Mirror’s” focus is ultimately one on contemporary concerns. Certainly, science fiction has always been a lens through which to do that, but the further we look into the future the more likely our speculation is to become untethered. The fact is that the future begins now and to consider what the “Library of the Future” or the “21st Century Library” will be, we need look no further than to what is happening and being built now. Will we find books in our libraries? Library administration officials in New York City based, ostensibly on speculation that the future is not one of physical books, but more likely upon the fact that books take up real estate they want to sell, are getting rid of books fast. Millions of the NYPL’s books that used to be in Manhattan are gone. 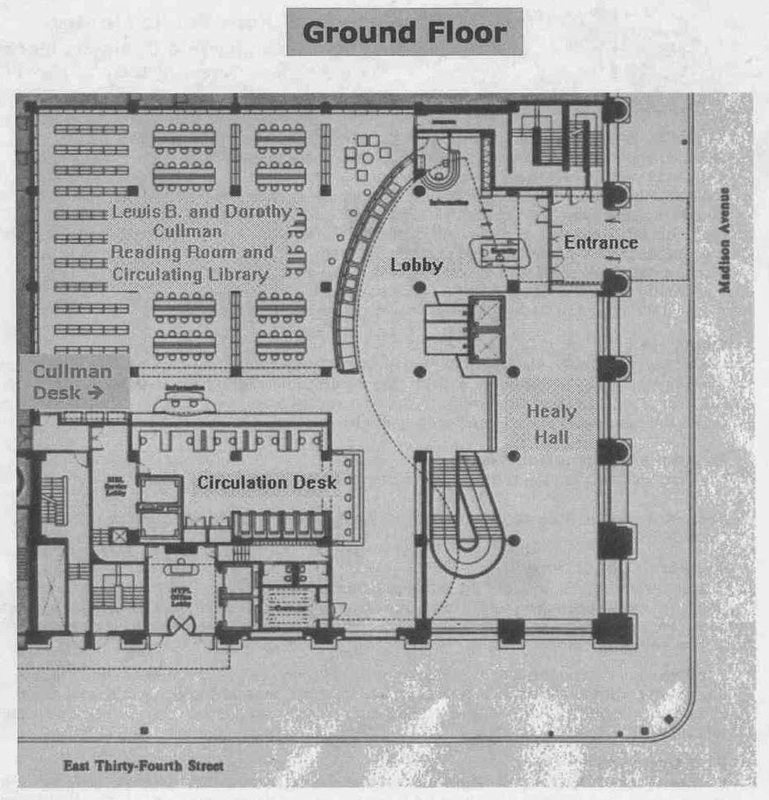 In the case of replacing the destroyed Donnell Library with a far smaller one, the architects for the future shrunken were given no instructions or information about how many books their design should seek to accommodate. Other architects designing new city libraries say that library officials leaned on them to reduce the amount of book shelves they sketched into their designs. In “Re-Envisioning New York’s Branch Libraries” workshop sessions convened to showcase broad suggestions being made by the Center For an Urban Future, architects speak of “inverting the ratio” of space in libraries used for books (once the core mission of libraries) versus other uses so as to drastically reduce the space for books. City Councilmen like Brad Lander specifically invoke futurism with phrases like “Library of the Future” and the “21st Century Library” to justify the expectation that books should be banished. . . . although Mr. Lander also envisions rebuilding such “21st Century Libraries” as disaster recovery centers to be ready as bulwarks in the face of climate change disasters (much like “The Day After Tomorrow” where the library's books were burned as they were diverted to the purpose of surviving a disaster?). 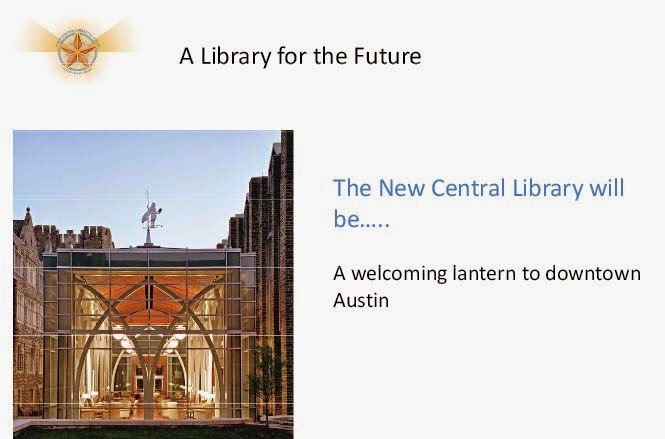 Construction of a Real Library of the Future in Austin, Texas- With Books! But that is New York. I recently visited Austin, Texas, a city noted for its technological advancement and identity. It’s the home of the South by Southwest (SXSW) conference that focuses on tech and culture (the SXSW Film and Multimedia Conference component), including libraries and their future, in addition to the festival of music out of which the conference originated. It’s also the home of Dell Computers its largest private employer. Adam Dell, Michael’s brother is a partner at Austin Ventures, funding tech ventures and the city's largest venture capital firm. Facebook and Google have moved entire divisions to Austin, where you can also find operating centers for 3M, Apple Inc., Hewlett-Packard, AMD (Advanced Micro Devices), Applied Materials, Cirrus Logic, Cisco Systems, eBay/PayPal, Bioware, Blizzard Entertainment, Hoover's, Intel Corporation, National Instruments, Samsung Group, Silicon Laboratories, Oracle Corporation, Hostgator, AT&T, Flextronics (formerly Solectron), Freescale Semiconductor and United Devices. Austin isn’t shrinking libraries or getting rid of its books. 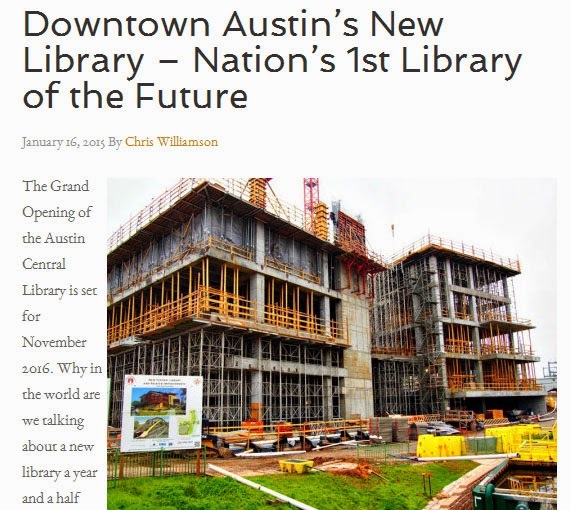 Austin is building a new grander $120 million central library. Billed as the first "library for the future" (and/or “library of the future”) in the United States and the second in the world, it will, at 198,000 square feet and six stories, be close to twice the size of the 110,000-square-foot Faulk Central Library it replaces. A circulating library, it will also have more books . . . 530,000 books, a nearly 25% increase over the 430,000 volumes at the current library plus it will have an additional 24,000 electronic books. The growth will be all the more pronounced because Austin will also, at the same time, get to keep its old central library. The 110,000-square-foot Faulk will become a Central Reference Library where archived materials (archival collections, photos, film, media, civic records) can be accessed. The Faulk currently stands next to the Austin History Center that will expand into it with some of the expansion of space being used for exhibition of historical displays and some may possibly be used for classroom space. Nancy Toombs, head of Public Services for the History Center, says the History Center is currently packed to overflowing with what staff assesses as 50,000 square feet of materials in a 35,000 square foot building. In the struggle to accommodate all the material on-site they have, to date, according to Ms. Toombs, pressed into service not only basement storage, but offices, kitchens and bathrooms. While it is no small distinction that the Austin Public Library and the History Center are keeping and expanding their materials, that doesn’t prevent them from also envisioning and planning to have the same kind of spaces and facilities that New York library administration officials conversely promote as reasons to banish books. There will be community spaces to gather, plenty of natural light, an airy atrium, lots of computers and technology (and “electronic delivery of information” will get its focus too), event space, a dozen meeting rooms. Yes, there will even be, “a street-level café.” See the Austin Statesman and the Austin Library’s Press Release: Designs coming into focus for Austin's new central library, Thursday, Sept. 27, 2012, and Coming Soon! A New Central Library- Press Release. But in New York where spaces are being shrunk with everything happening “flexibly”pell-mell on top of everything else with “no partitions,” New York City library administration officials are touting the idea that libraries should be “loud” (with a `non-shush' policy). With the opening of Mariners Harbor, the NYPL's most recently designed library, we learn that it is supposed to be LOUD and NOISY! : "`We encourage noise,' said Elizabete Pata, the library manager. `I'm not the typical librarian, shushing people.'" The full shelves of an Austin library branch, the Manchaca Road Library. In New York we have a City Councilman, Carlos Manacha. The Red Hook and Sunset Park libraries for which there are controversial plans are in his district. 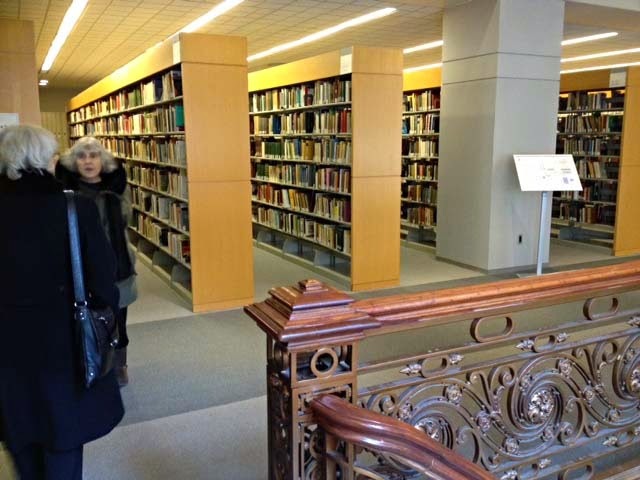 Example of empty shelves in two Brooklyn libraries the BPL wants to shrink. On the left Brooklyn Heights and on the right the Williamsburg Library. For more pictures of empty NYC library shelves see: Empty Bookshelves As Library Officials Formulate A New Vision of Libraries: A Vision Where The Real Estate Will Be Sold Off. With its final plot twist the Twilight Zone "The Obsolete Man" episode offers up what turns out in the end to be an ambiguously trick title: Is "The Obsolete Man" the librarian Romney Wordsworth, or the state official who would deprive the public of books and libraries in the name of his own vision of a better, purer future, limited to what they consider relevant? New York Libraries are now used more than ever. More people visited public libraries in New York than every major sports team and every major cultural institution combined. There has been a 59% increase in circulation (physical books preferred despite efforts to steer the public into digital), and a 40% increase in programmatic use. The funding of libraries costs an almost unimaginably small fraction of the city's budget. . . and the wealthy in their aeries of the sky like private libraries to be features of their luxury apartments (See: Tuesday, April 29, 2014, What's Wrong With These Numbers? : The Baccarat Tower's $60M Penthouse and NYC's Library Budget.) . . .
. . . But somehow, those with interests alien to the rest of us are have drastically cut back on the funding of the city's libraries, planning to sell and shrink them, eliminating books and librarians, consigning books and librarians to "Oblivion." This kind of book burning and cultural eradication would figuratively subject the public to the sort of "mandatory memory wipe" sacrifice of our human race's patrimony referred to in the film of that title. Those formulating these choices would do so ignoring what the public would choose for itself. Obsolete? Oblivion? That's the "Library of the Future"? Without wanting to give away all the plot twists of "Oblivion," it is worthwhile to caution that those in charge don't always have the interests of humanity in mind no matter what they tell you. . . so is the State, the entity he worshiped. Any state, any entity, any ideology that fails to recognize the worth, the dignity, the rights of Man, that state is obsolete. A case to be filed under "M" for Mankind - in The Twilight Zone. 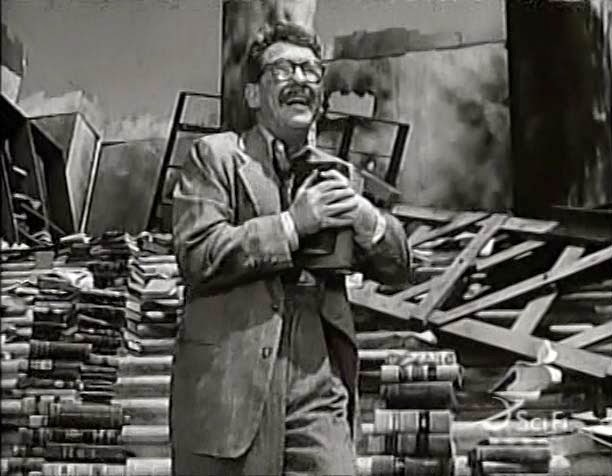 In the ruble of a civilization-destroying nuclear strike, bookworm Henry Bemis discerns his public library, arousing his hopes.